TO appreciate the reasons which prompted Bert Hinkler to build the little two-seater machine which he has named the "Ibis" it is necessary to go back a few years. “Bert'' had made his famous flight to Australia in 15 1/2 ДальшеMore>>> days in the Avro "Avian" (Cirrus), had spent some months in his native land, and had returned to England. On the flight to Australia, in which he acted as pilot, engineer, navigator and general handyman, Hinkler had found time to ponder on the way of things, and he had not found all of them good. In Australia he added more experience to his already considerable store of that commodity, and when he came back to England he was very sure of what exactly he wanted in the way of an aircraft. The machine should be comfortable both for pilot and passenger. The view from the cockpit or cabin should be good in all directions that mattered. If the machine could be made an amphibian without too great sacrifice in performance and / or useful load, so much the better. It should be as nearly immune from forced landings as it was humanly possible to make it. Hinkler looked around the British aircraft trade and did not find a machine which exactly fulfilled his somewhat difficult requirements. He then got out the general scheme of what he thought his ideal machine should be, and he took the scheme to a few aircraft firms with the object of getting one of them to take on the building and marketing. He did not succeed. Whether the firms were too short-sighted, or whether Hinkler was too far ahead of his time, or whether merely the psychological conditions were not right, or whatever the reason may have been, he failed to get anyone to take up his ideas. Being energetic, resourceful and well able to use his hands as well as his brains, Hinkler said in effect: "Very well; if you won't build the machine, I'll build it myself." And build it he did. Not, of course, entirely single-handed. That would have been well nigh an impossibility. Mr. R. H. Bound helped him with design and construction, and Mr. Basil B. Henderson designed for him a wing in which the Henderson patented type of wing construction was used. But much of the actual work was Hinkler's, and practically all the original ideas were certainly his. The "Ibis" (as Hinkler had decided to name his machine) was built under far from favourable conditions. A very small shed at Hamble was commandeered, and here some of the work was done. At his home at Sholeing Hinkler did the scheming, and, we believe, some of the smaller work, although it is not true that such items as engine cowls, etc., were formed on Mrs. Hinkler's wringer! But, in all seriousness, the "Ibis" took shape in spite of great difficulties As Hinkler himself says, when some small point cropped up, such as the machining of a fitting, he had to suffer long delays while the job could be done by someone or other. In an aircraft works it would have been a trivial thing, and done by the shops in half an hour. Under the conditions in which the "Ibis" was being built it most likely meant many days' delay. However, the work progressed, even if but slowly, and the machine was finished and flown. The "Ibis" is, as the photographs will show, a cantilever monoplane, with a boat-like fuselage and the two Salmson A.D.9 engines mounted in tandem above the wing. Nowadays the arrangement is apt to pass almost unnoticed, but when Hinkler first conceived the idea there were few machines with their power plants so arranged. Hinkler decided on two engines because he wanted to be entirely free from any fear of a sudden forced landing. In Australia, for which country he mainly designed, there are many large areas where forced landings would be at the very least highly inconvenient and probably serious, but it also has an enormous coast line with many bays, and a number of rivers navigable to marine aircraft, so that the ideal of an amphibian flying boat was at the back of Hinkler's mind all the time. With two engines rendering the likelihood of sudden forced landings very remote, and with a retractable undercarriage on a flying-boat hull, he felt that there would be very few places where he could not go. The first "Ibis" is not actually an amphibian, but the fuselage has quite obviously been designed with the amphibian in mind, and actually the structure has been so devised that it would be possible to build on to the hull a pair of steps. The undercarriage is not at present retractable, but could quite easily be made so. The fuselage, or hull, is of wood, as Hinkler could obviously not tackle amateur metal construction. Methods were, however, devised whereby the wood was rendered unusually resistant to water soakage, and the shape of the hull is such that a metal version (with steps) could be built fairly simply. The two Salmson A.D.9 engines are mounted in tandem above the wing, and Hinkler managed to scheme out a very simple engine mounting. Once he got to the flying stage he made many experiments with the object of discovering the best arrangement for keeping the rear engine cool. He had, we believe, no really serious trouble with overheating of the engines, but he wanted to be sure, and he wanted to get the cooling for the smallest possible price in drag. Propellers are apt to be expensive items, and we believe we are correct in saying that Hinkler never had a pair of matched propellers. That is to say, his propellers were alike, and not of different pitch, as they would have been had he been able to afford experiments to find the best combination of pitch and diameter for each propeller. In spite of all these difficulties, Hinkler really managed to do a great deal, and the "Ibis" flies very well. One of the things Hinkler had set himself to do was to provide a good view. The relative position of engines and pilot has been so chosen that the view is quite remarkably good. The little cabin has accommodation for pilot and passenger seated side by side, and both can look over the nose of the hull at a very good angle, as is shown in one of our photographs. The proximity of the front propeller to the windscreen can be criticised, especially in connection with an idling engine when the machine is about to take off. or just after a landing, and if the machine were used as a flying boat, this arrangement might interfere a little with the freedom of the crew to pick up a buoy unassisted. The "Ibis" has not, we believe, "been through Martlesham," and so no official performance figures are available. The machine appears, however, to have quite a good turn of speed, and its manoeuvrability is obviously good. It is very much to be hoped that Hinkler will find ways and means to develop the type for general production. The layout is not ideal, perhaps, but it has in it the makings of a very useful type. 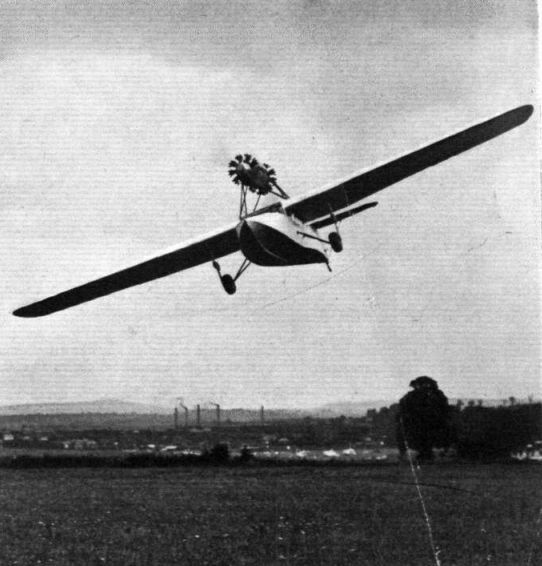 THE HINKLER "IBIS": This is the first photograph of this machine in flight to be published. It is fitted with Salmson AD 9 engines in tandem, and the view from the cockpit is quite exceptionally good. Mr. Hinkler is now seeking capital to develop the type. THE "IBIS" IN FLIGHT: That the view is good is shown by the fact that in this picture the upper half of "Bert's" head is visible. 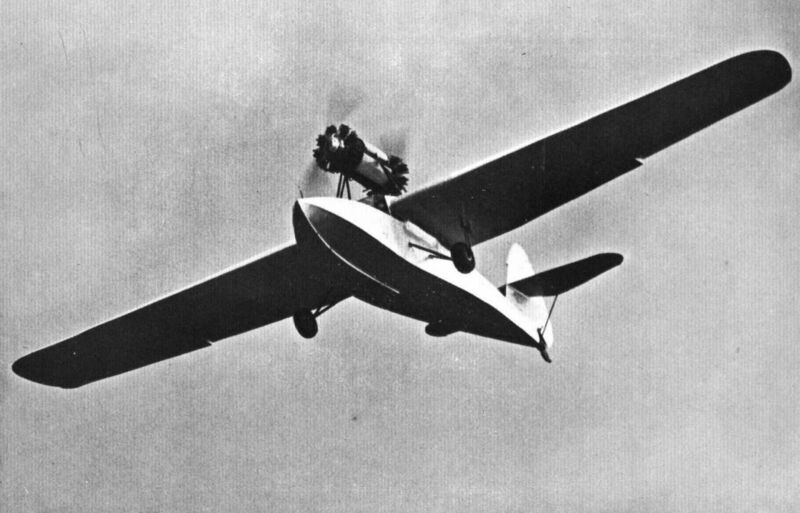 THE HINKLER "IBIS" : The experimental machine is not an amphibian, although the possibility of turning it into one has been taken into consideration in the design. SIDE VIEW OF THE "IBIS": The tandem arrangement of the two Salmson A.D.9 engines looks very simple but caused Hinkler a lot of thought.